With Integration, you can quickly and easily integrate your form with your website. By following a few simple steps, you can generate the code and then copy-and-paste the resulting code to your website. Direct - This is the simplest option. Use it for testing or creating your own custom integration using the URL provided. Embedded - choose this option if you want to embed the form directly into a page in your website. This is a great option when you want to hide the logiforms.com URL and achieve seamless integration with your web site. Pop Up Window - with this option, you can open the form either as a new window or a lightbox overlay. There are many additional settings for this integration type, including a feedback button and automatic display. Advanced - This method provides all of the forms HTML for you to copy and paste and host on your own website/server. 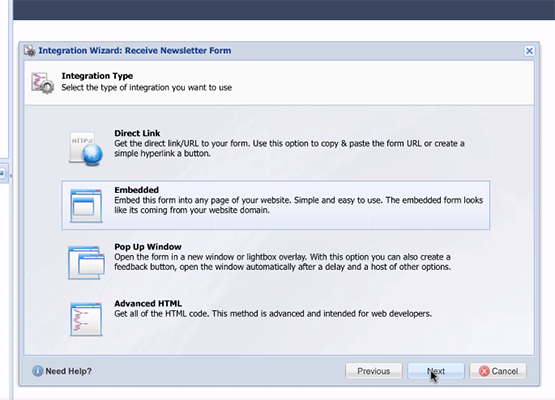 If your page has a username and password special field, the integration wizard will generate code that also includes the login page for returning users. You would probably include the code in an autoresponder, notification, trigger, or PDFs generated within Logiforms.